Man the capabilities of this plugin are just getting better and better. Nice video, Thur! Thanks guys, I'm glad you like it. For anyone who got error messages when upgrading to version 3, please update to 3.01, which is now on lotrointerface. Access to the path 'C:\Users\fade2gray\Documents\ The Lord of the Rings Online\Plugins\Thurallor\Commo n\Utils\LibCompress\luabit-0.4\hex.lua' is denied. Interesting. Apparently I have accidentally set the read-only bits on some of the files in the .zip file. If you originally installed the plugin with Plugin Compendium, that wasn't a problem; apparently Plugin Compendium ignores the bits and makes all files writeable. But if you originally installed it manually, and then tried to update with Plugin Compendium, the read-only bits are a problem. I just posted a new version that fixes the permission bits. Thanks for letting me know. Is their a way to lock sequence bars so we don't accidentally move them in the heat of clicky-combat? Yeah. Just right-click on the title/caption, and choose "Lock -> Position". You've used a period instead of a colon which generates - "Watcher.lua:318: Invaild member function call". Attempting to insert a conditional event into the last slot (12) of a new bar, with 7-11 being empty, gives - "SequenceEditor.lua:1556: attempt to index local 'info' (a nil value)". Event behaviors for bars and groups can now be triggered "when the target changes"
"when the target changes" does not appear as an option in group behaviours menu. Thanks, fade2gray. Version 3.03 fixes the above bugs and this. Now posted at lotrointerface. Last edited by Thurallor; Mar 12 2016 at 09:44 PM. >> "What kind of program is it possible to write?" I would like to *SEE* what ANYONE has done with their coding in regards to this LUA feature of SequenceBars. I cannot get the IF/THEN/ELSE to work the way *I* would expect, no matter what I try. The condition is the return value of the specified Lua script. Use this if you want to test a condition that is not listed above (and you know Lua programming). When you select this condition, a Lua script equivalent to the previously-selected condition will be shown, so you can easily modify it. You may use this to build more complex expressions that include "and" and "or" operations. I do not see any such "script equivalent" which I am supposed to be able to "easily modify." I believe it would be nice if that little edit field for the LUA SCRIPT actually pointed to a sub-directory that contains *.LUA file(s) for that feature to LOAD/ USE. Clicked on "Beorning Wrath > X%". Then scrolled up the list and clicked on "~Lua Script~". Copied the code in the small script window that appears. Paste the script in a text editor and modify it to my satisfaction. Copy and paste the script over the original in the script window. Thanks for sorting out the directory tree. Non trivial no doubt, but is there any chance of making that little script window a larger flyout window? "Your submission could not be processed because a security token was missing." I have a current copy of my SequenceBars.plugindata I would like you to look over and see if you can give me specific assistance with what I am actually trying to do (not specifically LUA scripting, actually). Please let me know when/if I can pm you the contents of the *.plugindata . Last edited by PENwaru; Mar 20 2016 at 03:08 PM. Thanks for helping with PENwaru's questions. I'll see what I can do about this. 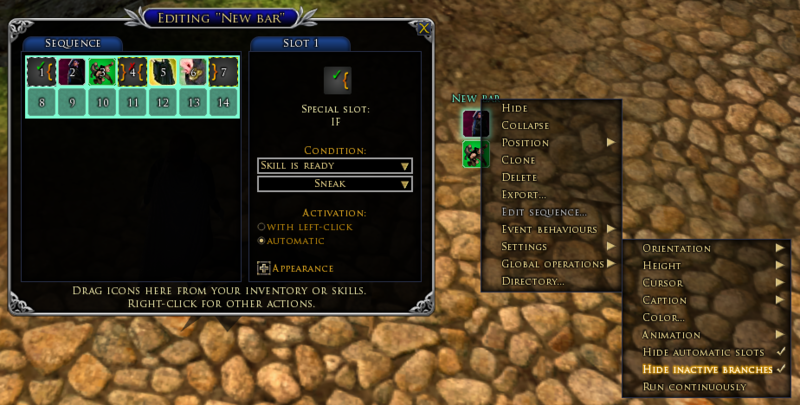 When "Sneak" is ready, slots 2 and 3 are displayed in the bar. Otherwise, slots 5 and 6 are displayed. However, the condition is not evaluated continuously. It is only evaluated when the bar resets (e.g. by clicking on the caption "New bar", or by clicking the last icon in the sequence). At that point it makes a choice of which icons to display, based on whether the "Sneak" skill is ready. If you want the plugin to continuously check whether the "Sneak" skill is ready, and update the displayed icons continuously, then you will have to reset the bar continuously. This can be done by assigning an event behavior to the bar that makes it reset when a user event occurs. Then make another continuously running bar that is constantly emitting that event. This is similar to what I did in my last demo video. THANK YOU! THANK YOU!! THANK YOU!!! for the response! If you delete all but the first slot in your "SEQBAR 4RESET" sequence, it should work. Standard quickslots cannot be run automatically; you have to click them. So even though you have it set to "Run continuously", the sequence stops when it gets to slot 2 (your milestone skill). To import this, you can use the "Import" feature in the right-click menu of any group in the directory. Last edited by Thurallor; Mar 22 2016 at 09:02 AM. Version 3.04 is now posted at lotrointerface. Fixed a problem that might cause "Effect is/not present" conditionals to fail and generate an error message. You can now resize the slot properties pane to make it wider. When editing a Lua script conditional, you can now resize the Lua script window to make it larger. While you're editing a conditional, the current value of the condition will now be shown. Last edited by Thurallor; Mar 22 2016 at 09:41 AM. Might be an opportune time to request an additional function, especially useful for PENwaru's situation and others I can think of - https://youtu.be/_5TOW_LqX48. Would that have been anything to do with the "stack overflow" errors I was about to report? I also find the Lua syntax error highlighting helpful - shame that np++ doesn't have a syntax checker. I added some "when target changes" event behaviors. You can now make a bar that will "Reset when target changes", containing nothing but an if-then-else conditional that generates two different user events, based on whether the target's morale > 0. The condition will be false for inanimate objects and stationary NPCs. It will be true for hostile mobs and monster players. But unfortunately it will also be true for mobile NPCs (e.g. town guards) and friendly players. You can use the two user events to show/hide a different set of bars depending on the condition when the target changes. I came up with the following Lua script which will only trigger on animate targets depending on the difference between the level of the player and that of the target, i.e. if difference = 8, only monsters with a green threat level or higher will trigger a behaviour (will also trigger on friendlies with a difference of 8 or lower). Toggling between alignment = 1 and nil will not-trigger/trigger when targeting yourself (don't know if this may have adverse effects elsewhere). Odd discovery, the mustering horn in the South Barrow Downs has a level of one. Doubtful. Please let me know the error message and the scenario if it happens again. Looks to me like GetAlignment is only defined when the target is the player. Not very useful, although it can tell you whether you're a freep (1) or a creep (2). Please let me know the error message and the scenario if it happens again. Working on how to explain the circumstances. Adding a conditional if-then or if-then-else, then immediately try to delete it causes a looping string of errors needing SB to reloaded (creates a >60KB log file). Edit-2: Revision History (22-Mar-2016) Version 3.05: Added "Skill is/not ready" condition. - shouldn't that be "Skill is/not usable"? Last edited by fade2gray; Mar 23 2016 at 09:12 AM. Thanks for the report, 3.06 should fix it (awaiting approval). I had been experimenting with Skill Ready/NotReady and different skills with various cooldowns, and at one stage I had developed a rather long and convoluted sequence of conditionals, with some being nested. The sequence appeared to work as expected, but when I started clicking through it very rapidly it suddenly stopped working and froze with the green circular arrow showing. Reloading SB didn't make any difference, so I added a User Generated Event at the end of the sequence and added an event behaviour to try triggering a reset, and this is when I started noticing the following stack overflow errors. After further investigation I discovered the root cause; during the frantic clicking, somehow all instances of 'if Skill Ready: Penetrating Shot' had been replaced with 'if Skill Ready: Improved Penetrating Shot' which is still untrained. Since deleting the original sequence (created with SB 3.00) I've been unable to reproduce the exact event where the Skill Ready parameters got replaced, but the errors can be forced using the following sequences to simulate it. Last edited by fade2gray; Mar 24 2016 at 04:08 PM. Thanks for the test case. Reproduced the error. Should be fixed now, in version 3.07. Last edited by Thurallor; Mar 25 2016 at 01:09 AM. I've thought about just adding a generic "Lua script" special slot, so you could put variable assignments or whatever you want in it. Of course, you can already do this by creating an if-then slot pair and just not putting any slots between the braces. But that's slightly less elegant. I don't want to go down the path of making a special variable assignment slot, because then there's a whole plethora of slots that logically follow, such as incrementing a variable, comparing a variable to a value, etc. that just amount to trivial repackaging of simple Lua statements. I think anyone savvy to use such features would have no problem writing the equivalent line of Lua code. And there's a point of diminishing returns where adding more seldom-used features makes the main features harder for novices to understand and use.